The Pebble Beach Concours d’Elegance was a sight to behold with all manner of drop-dead gorgeous vintage machinery on display. Unfortunately, that’s also its problem. It’s no longer an event for cars. It’s a glorified museum on a golf course. Cars are defined by their function. They transport people and stuff from place to place. They can be used for fun. For pleasure. For cruising. For racing. Or even merely for sitting in the backseat and being chauffeured around, like the oligarchs of Pebble Beach no doubt are. Part of me understands the concours set, with its absurd attention to detail and maniacal devotion to cleanliness and condition. But let’s be honest: Pebble Beach is not a car event. 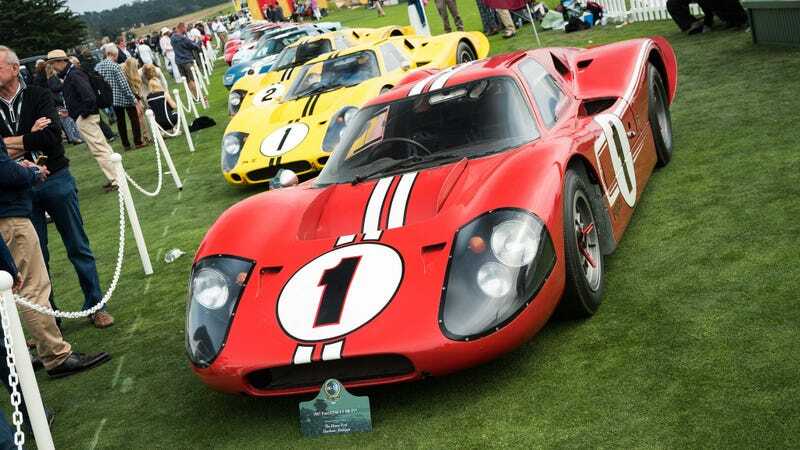 You can’t hear most of the cars at Pebble Beach running for longer than a few minutes. They’re parked and off-limits. They were objects to behold. Some are roped off. Others had handlers to ward off anyone who wasn’t actively judging a car from getting too close. Our photographer and I were both snipped at for getting too close to a Miura we adored. So many surfaces inside that car were coated in supple, perfect leather that it looked like sitting in the womb of a cow. That’s its purpose: a luxurious and comfortable place to sit. We couldn’t even get all that close. That’s no way to experience a car. Pebble Beach left me with weird feelings of disappointment and awe. On one hand, here is a collection of once-purpose-built art-objects that I’d likely never see anywhere else. On the other hand, not a single vehicle there really felt as if it was in the proper context of being a car. No car quite epitomized this bizarre combination of feelings as much as the 1931 Duesenberg Cummins Diesel Special Indianapolis 500 racer on display. It was weird! It was a diesel! It probably would have shook the ground around it and broke the golf club’s greens into the ocean! But its tailpipe was taped over, and there’s no way it would be starting today. It felt like the weirdest loss. Here’s a race car I’m impressed to see, but I feel like I’m not really experiencing it at all without beholding it on track, at speed. It’s like having a bag of chips in your favorite flavor that you can’t open. There’s good reason why our favorite car of the show was a Cadillac limousine a family had restored to drive on road trips. While I have no doubt that most of the entrants are enthusiasts, finding the few who drive the cars instead of stress about how adding mileage devalues them really restores your faith in humanity. That openness and enthusiasm to explain the car and let onlookers poke their heads in was contagious. To me, a car that’s not driven and used isn’t really a car anymore. It’s an art piece you keep on four tires. There are cars that I don’t like on their own merits that I love anyway because of their owners’ enthusiasm. It’s all too often not the car itself. It’s how it’s used as a car. Most of Pebble Beach’s cars weren’t built for hooning, but still should get more use than a drive across a golf course. The winning car, to Concours d’Elegance judge Dr. Paul Sable, was one that would best fit in arriving at the Beverly Hills Hotel in say, the 1930s. Taking people places as a car is meant to do. I’d like to see these magnificent old beasts doing just that—touring the countryside. Perhaps even giving rides. Cars need context. Otherwise, they’re vaguely mechanical-inspired sculptures. Pebble Beach is a very nice sculpture garden. Go seek out the owners of cars who snuck in and you’ll enjoy it far more.